Pruning Knockout roses – Johntheplantman's stories, musings, and gardening. When do I prune my Knockout roses? Frances Bonner asked if she should prune her Knockout roses since it was well into November, but they were still blooming prettily. Lots of people have asked the same question. Actually, I get a lot of questions about caring for these wonderful plants. This Knockout rose is planted in a large pot. It was pruned well in March and fed every 2 weeks with liquid fertilizer. Still blooming in mid November. First, I went to the grower and found this picture of hundreds of uncut roses. This told me something. 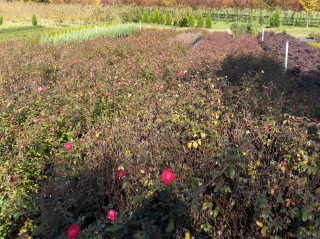 Hundreds of Knockout roses waiting to be pruned at the wholesale grower's nursery. Picture taken mid November. The grower says it's good work for his crew in January. My mother has some magnificent Knockouts in front of her house in Kingsport, Tennessee which are still blooming in November. I told her to leave them alone except for “deadheading” (taking off the spent flower heads) and to wait until January to prune them. There are three reasons for my advice. One is that sort of “gut” feeling that I get about how to treat plants. 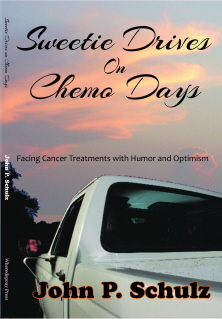 I have developed this over more than thirty years of being a grower and landscaper. Reason two is because the plants are still pretty, so why bother them? The third reason to wait is because it has been a mild winter so far and the plants have probably not had enough time to winterize. If they are pruned and some warm weather shows up, the lateral buds may be fooled into thinking it is time to grow. If they start their soft new growth and a freeze comes, the new growth will suffer some damage that will require the plant to form new buds for spring growth. This is, however, mainly conjecture on my part. If you have already pruned them, don’t worry. 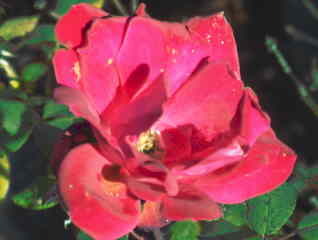 When you do get around to cutting back the roses, look for a new growth bud on a healthy stalk and cut just above it. This will be next year’s growth. I always try to take off (or at least cut back) the spindly stems that have been shaded through the summer. I usually cut the plants to about 18 inches from the ground, more or less. One thing to remember when the Knockout rose is actively growing and blooming is to cut off the dead flower heads. This is called “deadheading” and it works with almost all flowers. If you deadhead the plants, the plants will bloom much more heavily. This is true of pansies, roses, marigolds, and many more of our beloved flowers. While working on this article, I visited one of my clients, Susan, who showed me that a herd of caterpillars had eaten all of the leaves off her roses in one day. She said she would like to prune them back but thought it a bit too early. She agreed that new growth may be hurt if they are cut before it gets really cold. Susan is a knowledgeable gardener. What it boils down to is, let the roses bloom as they wish. Then cut them when you wish. Everything will be all right. And before you work on the roses, remember, get some good gloves. John, nice article. Sorry I pruned my knockout roses yesterday. However, I didn’t prune them too far back, just shaped them and had some blooms for the house. This is an amazing rose! 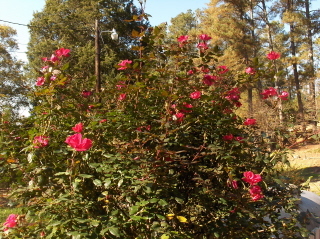 I see people slow down as they pass my yard to see the still-blooming roses. As you know, my mama always had roses. She wasn’t talking about knockout roses but when asked how far back to prune, she always said “Prune them until you think you’ve ruined them.” And she always had roses. Looks like I’m gonna have to get me a knockout rose. Thanks for the information John! I think I will let mine keep blooming and see how long they will go. I still confused about pruning. I live in Nashville and have over 20 knockouts planted. The olderst one’s are over 6′ and I think they need to be pruned–how much should I remove and when? I hope you tell me something similar about my Clematis plants, because I don’t know if mine are type 1,2, or 3! Will they survive if I prune them back, and should I do this after a good hard frost, or wait until early spring? I have one that’s a light lavender/pink-large blooms. It is the first to bloom and is beautiful in the early spring, so I would think I would prune it back now..or maybe leave it alone and never prune it for fear of “messing it up”! The others bloom later, and I need to move some wire behind it …. so need to prune before I can do that. Also, how about maintaining a certain height on a crepe myrtle without committing “crepe murder”–HELP!!!! and thanks. I had some knock out roses planted this past spring and really love the flowers! I noticed that I have some plants that produce a bush that is about 5′ tall and sorta round. I also have a few plants that are very tall and fall over. I have staked these plants but feel they are not really knock out roses. I found out the man who supplied and planted the roses mixed in some olympiad (macauck) roses. Question is: is there anything I can do to these roses to make them bush out like the other plans do or should I just replace them? I just did a hard prune on a clients thirty over-grown knock-outs. I live in N. Georgia and was a little nervous. Thank you for calming my nerves! You probably saved the roses. They seem to love a good cutting back.